There comes a time in every guitar player’s musical journey when buying a pedalboard simply becomes a must. This usually happens around the purchase of the third pedal, when most folks realize that there is only so many pedal that a single power adapter can cover. What to look for when buying a pedalboard? How much money to spend to get a good pedalboard? Do I need to get any accessories with a pedalboard? Can I make my own pedalboard? What’s the best pedal order in a pedalboard? So what exactly is a pedalboard? Well, on one hand it’s essentially a casing to store all of your “top” pedals in, but there’s way more to it that meets the newbie eye. The most important aspect of a pedalboard is the electronic department, as the device contains intricate wiring that allows you to connect a number of pedals within it, and then plug the whole thing into a single power socket. And seeing that individual pedals require one power source each, you should get the idea on why boards are so essential. Anyhow, we took the liberty of sifting through today’s market in an attempt to find the best guitar pedalboard in the world. We looked through a variety of price ranges and narrowed our choices down to 10 champions. If you’re up for it, the rundown patiently awaits below, along with some other tips and discussions. Important note before we start: Pedals are NOT included with pedalboards and need to be purchased separately. Let’s do this now! Produces zero noise and crackle. Heavy duty item that’s very hard to shake up or damage. Compact, classy and maximally efficient. High versatility and top-level circuitry. Featuring chrome hardware and a high-density foam-padded interior. It comes with a strong adapter capable of powering up to 12 devices. Fits 6 pedals of various size. Designed with one thing in mind: ease of use. Sturdy as a tank and very easy to use. Creates some cable commotion, but will keep the signal loud and clear. Somewhat recently released, the DB-2 model from Donner is one of the more popular pedalboards of 2016. Crafted from light, yet durable and sturdy aluminum, the device comes with total dimensions of 20 x 8 x 1.2 inches (510 x 200 x 30 mm). You can easily fit up 8 standard-sized pedals here, and go up to 10 or even 12 if you jam on mini-sized devices. The circuitry is just fine and produces pretty much zero noise and crackle. We are looking at a light product weighing in at 2.6 pounds, and a 40-inch professional grade adhesive backed hook-and-loop for securing pedals and zip ties has also been included in the mix. To sweeten the deal, the manufacturer threw in a gig bag for free. A very good deal indeed! As one of the most popular models in the market, the Gator G-Tour is a bonafide pro item with top-notch construction, high-level electronics, classy looks and a fair price. You can fit 12 standard stomp-box pedals into this puppy, or use the 24 x 11 inches if board surface in a way that suits your needs the most. We are looking at a plywood fabricated product with an aluminum valance and a 3M dual lock fastener for pedal installation. The manufacturer left room in the casing to store cables and adapters, and also placed a few nifty handles for storage in all the right places. This is a heavy duty item that’s very hard to shake up or damage, highly recommended for touring artists. If you’re a fan of micro pedals – and we sure are – and like your pedalboard compact, classy and maximally efficient, we recommend the FC-M6 from Mooer. With a size of 6.7 x 21.5 x 3.9 inches, this item is capable of storing up six micro pedals and includes a set of preinstalled power outlet strips. 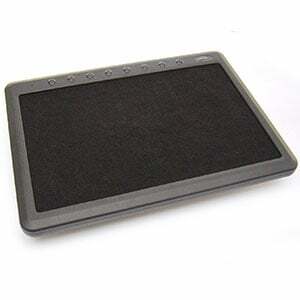 Apart from sturdy build and top-notch electronics, which happen to be obligatory factors for any item to make this list in the first place, what we liked about this product is the aesthetic factor. We are great fans of the classy light grey vibe, it’s just so professional and elegant. Great deal for the money! If you like your pedalboard light, customizable for a variety of devices, and with all the necessary adapters and cables included in the price – go Boss! The company’s BCB-60 Deluxe model caught our eye in particular with high versatility and top-level circuitry. What some folks tend to complain about the plastic casing, but you can rest assured that this fella is as sturdy as durable as the metal models. What we love about it is the fact that not only an adaptor has been included in the price, but so have three ore-cut insert, one spare insert, five short L-L, and three long L-L cable, as well as 8-a pin parallel DC cord. The interior can be adjusted to match the needs of any player, which is a major pro point. In the budget-friendly and more compact domain, we absolutely recommend the UPC-424 pedalboard from Stagg. This fella can stack up to four pedals inside, featuring chrome hardware and a high-density foam-padded interior. Pretty much everything about this fella is on par with the more expensive models we have mentioned here, except the smaller size. So if up to 4 pedals is what you’re planning to use, go for it! Made right in the US of A, the product features a size of 17 x 9 x 4 inches and a total weight of 3.5 pounds. Is this the best cheap pedalboard? It’s one of the strong contenders, yes. For users of standard stomp-boxes, and especially Behringer models, we thoroughly recommend the PB-600. This device has been optimized for the company’s pedals, with all the electronics sorted out in a highly efficient manner. For a Behringer pedal user, this is a glaringly obvious choice, but if you rely on stomp-boxes in general – regardless of the manufacturer – this is still a top notch option. It comes with a strong adapter capable of powering up to 12 devices, room for comfortably fitting 6 pedals, along with a six-way daisy-chain cabling system. To sweeten the deal, the manufacturer also included a three-year warranty. If you just need a casing for your pedals and can sort out the electronics on your own, look no further than the CNB PDC 410 E BK. Crafted from light but sturdy plywood, the casing comes with interior dimensions of 27.5 x 11.75 x 4.25 inches. That’s more than enough room to fit 6 pedals of various size, with some users reporting fitting 7 devices inside. Also included in the mix are steel locking latches with 2 keys, aluminum-reinforced edges, and a double stick tape. The price is significantly cheaper than the majority of other similarly-sized items, yet durability remains high-level. It is no secret that Gator is one of the leading manufacturers of the pedalboard niche, hence it should strike you as no surprise that we included two of the company’s products. Made in the US, the pedal’s surface measures at 23.75 x 10.66 inches, featuring top-quality construction and enough room for 12 standard stomp-boxes. The product comes with an angled designed for ease of use, along with a striking orange finish as an included universal mounting bracket. This is a high-end item with an edge worthy of pros! Now if you’re after the best pedalboard for micro pedals, we say definitely check out the ENO Ex model from EX Pedalboard. Basic and subtle, yet sleek and elegant, this item is sturdy as a tank and very easy to use. It comes with a total size of 21.6 x 9.8 x 4.7 inches (550 x 250 x 120 mm) and a weight of 3.9 pounds. 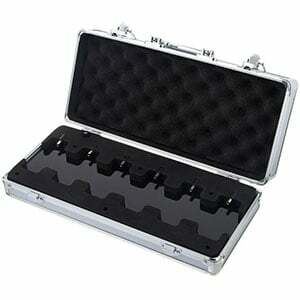 The device is capable of fitting 5 pedals and comes with an included high-quality waterproof gig bag. If you like your pedalboards concise, light and elegant, this is the winning ticket! Another good option for more budget-oriented folks is the SKB pedalboard. This device operates a an 8-port board, with separate inputs for each of the pedals. This might create some cable commotion, but will keep the signal loud and clear. 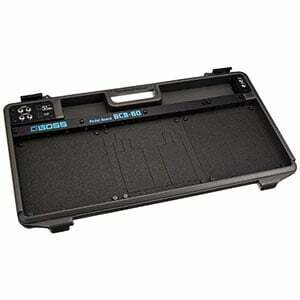 It includes a set of standard 9VDC output jacks and a quality gig bag for musicians on the move. The board was molded from rubber modified styrene and does a fine job both in keeping the pedals in place and protecting them during transport. For the listed price, this is a fine deal! With all that stuff out of the way, let’s focus on a few things you should know when buying a pedalboard and some of the frequently asked questions we get from customers. When it comes to pedalboards, there’s actually less factors and criteria to look out for that when a buying a guitar or even those very pedals you plan on sticking to the board. It’s quite simple – you need a sturdy built, practicality, good electronics, enough room, some nice looks according to your taste and good value for money. As far as sturdiness goes, it’s best to go with metal design, although plastic models can do just fine as well. Look for devices with electronic sections and jacks well protected, and also seek items where pedals can stand strongly in place. As for practicality, you’ll need boards that are easy to carry, assemble and disassemble. The electronic department stands out as the trickiest beast, so make sure that the offered power fits your pedals’ requirements and that there’s no crackle upon plugging in. It is also important to know how many pedals do you plan on using, how many you currently have and when you will reach the desired number of pedals. 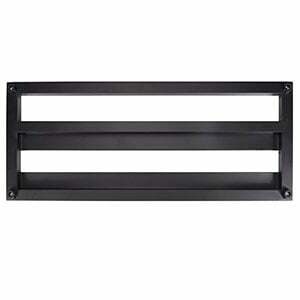 Pedalboards come in various sizes and can usually fit anywhere between 4 and 12 devices. Jot down how much room you need and pick your best option based on that. In the aesthetic department, most pedalboards are fairly similar, but there are some wilder options too; just look around and see which one feels the best. As for value for money, that’s where we come in to (hopefully) help. Essentially, these are the factors we looked for upon sifting the market, and we believe that the listed items match those criteria in the best way. This is where the aforementioned number of pedal you use comes into the picture. The price is greatly determined by the board’s ability to house more or less pedals, and of course grows with the number to devices you can connect to it. But a few basic price limits can be set here, and we can say that for around $50 you can get a decent board for 4 pedals, while $75 is the price for models housing up to 6 pedals. If you need 10 pedals, $100 is the price, while the $150 figure hits the soft spot for 12 devices. As noted, this is the number for decent and good pedals that are sturdy and get the job done. If you want some extra perks and qualities, further investments are of course possible. Yes, additional bits of gear are needed, but often included in the mix too. Specifically, you’ll need a power adapter, a set of small cables to connect pedals, and of course two standard cables to go from the board’s one end to your instrument and from the board’s other end to the amp. There’s a solid number of cases where the adapter is included in the mix, while some products also include small cables, although that’s a tad more rare. As far as music gear goes, pedalboards are one of the items that require the smallest amount of extra payments for necessary additional gear. But when you think about it, a pedalboard IS a necessary extra investment for players who want to have more pedals, so it’s all a matter of perspective we suppose. Anyhow, hopefully we’ve covered this question properly, on to the next one! This question is frequently raised among musicians, and that makes sense because a pedalboard is not an intricate item as far as music gear goes. Many folks thing that basic knowledge of electronics and craftsmanship is enough to make a board, and many of them are wrong. So while we’re not saying that homemade pedalboards are impossible, we are saying that you better know exactly what your doing – especially in the electronic department – if you’re going to venture into this endeavor. No matter your decision you should still consider a high quality pedalboard power supply. On the other hand, if you really know what you are doing, making one of these puppies can be an interesting activity, and there’s nothing wrong with giving it a go. Just watch out when playing with electricity, please! Pedalboards aren’t exactly a pricey piece of equipment, but some savings can still be made if buying a second-hand product. There are two things to watch out for – one is of course any type of visible physical damage, primarily on fragile parts such as hooks and handles. Where it gest tricky is the electronics section, as it’s difficult to tell the shape of wiring and internal connections based on taking a look, or even testing the board. And that’s basically the main reason why we believe that it’s the best option to get the new one. It will save you time and nerves, and you will get a warranty that’s usually no shorter that a year and goes as high as five years, or even a lifetime in some cases. This is a question so many guitarists out there are asking that we decided to give it a significant portion of space around here. So, how to organize your pedals and what’s the best signal chain? As the one and only guitar virtuoso Steve Vai once said, this order is not exactly of the greatest importance and it often comes down to preference and personal taste. However, a string of pretty objective guidelines and factors to follow in order to get a better sound also exists, hence we decided to delve into the whole matter a bit more thoroughly. While this is not the definite way, it’s a combination that many players use and something we believe works quite nicely. Check out the goods below. By drive pedals we don’t mean just the basic overdrive effect, but also anything related to it. This includes distortion, boost, fuzz, and similar gain-driven gentlemen. The primary reason why these dudes have secured a place up on the front line is because distortion should be as close to your instrument’s original clean signal as possible. The goal is to distort and overdrive the purest form of your sound, and that is obviously achieved by placing those drive pedals first. In case you are using both overdrive and boost, we find it is a good idea to place the boost first so the drive pedal gest the strongest possible signal. So in a nutshell, drive + clear signal = sonic bliss! Up next in line are wah and equalizer pedals. These devices operate quite nicely when plugged directly into a sonic signal that has been affected only by overdrive, boost or distortion. The wah is simply a type of effect that sounds top-level when it has distortion backing it up, while the EQ will give that overdrive a boost that will brighten up the final audio output and sound better. Up next, we bring you the modulation. The “modulation effects” is an encompassing term that brings together such devices as chorus, flanger, phaser, and vibrato pedals. As for the reason why the modulation crowd is at No. 3 is because their sound is significantly richer and more complex when placed after overdrive, wah and EQ. It is also a common belief that pedals of this kind should NOT be put at the very end of the signal chain as they can overpower the other effects that were placed before them. And if that overpowering happens to be the entire pedal chain, that’s simply not good. If you’re wondering what are time-related guitar effects, it’s delay and reverb. Putting these guys at the very end of the signal chain secures a more natural echo, which is exactly what you need. And if you are using both reverb and delay – which is cool and not a rare case at all – experts agree that placing reverb at the very end is the way to go, as it brings a natural echo to all the effects that come first. Another option you have is use built-in reverb coming from your amp. This one is a viable solution, but also expect a bit more twang in the final sonic attack. Thus, in a nutshell, the listed 10 devices stand out as clear contestants for the flattering title of the best guitar pedalboard on the market today. We did our best to cover a variety of budget ranges and types of items, so it is now up to you to jot down your personal preferences, needs and available spending budget, and single out the product that suits you best. To stay in loop on the best gear deals on the web and reviews of quality musical equipment, make sure to track Guitar Fella and follow the site for further updates. Thank you for your attention, you’ve been lovely!